All vierkant products were in operation at German train stations or airports for decades. After the clocks and displays have done their faithful service, they are used by vierkant as a raw material for unique products. vierkant transforms these historic originals into unique design objects by hand and by use of modern methods and technologies. At the German airport of Cologne-Bonn (CGN), millions of passengers were guided by the departure board. The departure board was disassembled by vierkant into individual parts, reconditioned and combined with a selfdeveloped control unit. An additional modern IT-interface and an indestructible Corian housing makes the Fallblatt CGN a representative display which shows relevant data and gives digital information a unique spatial quality. 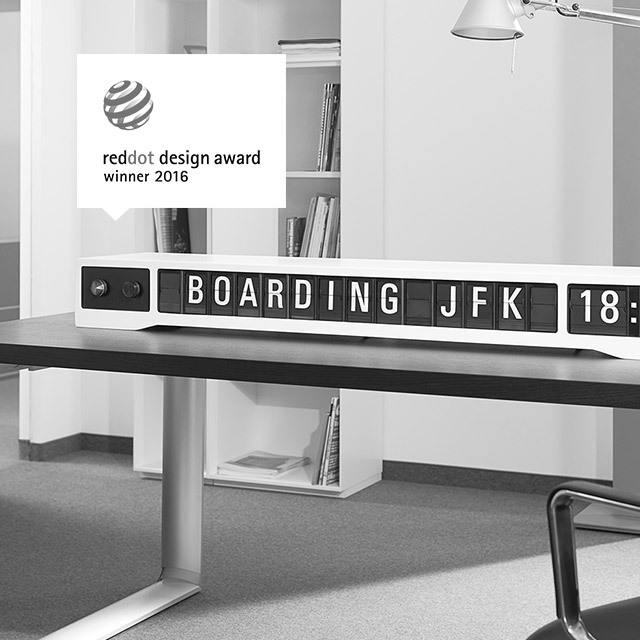 Whether memories of a joyful welcome or of heartfelt farewells – the original train station clock of the Deutsche Bahn arouses emotions. vierkant inspects the available material and selects only the finest which are restored and renewed by giving them an indestructible coating, solid wall mounts and stainless steel buttons. The objects of the series Kantuhr unites the robust quality, durability and timeless design of the design classic. A glance at the dial with the red second-hand is enough to guess the origin of this clock. The particularity having an illuminated dial on two sides of the clock eliminates the last doubts. 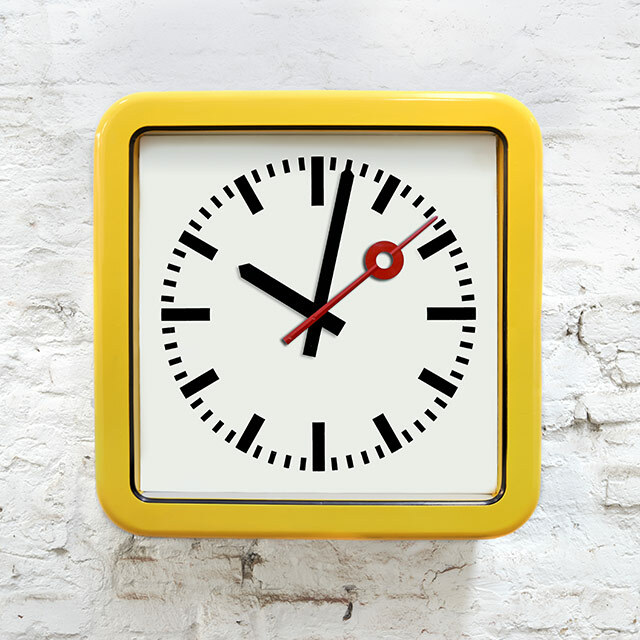 The Blockuhr (Cubical Clock) is a real train station clock that was installed on German platforms for several decades. Station clocks are manufactured with two simple requirements: good readability even from a distance and maximum resistance to wind and weather, as well as to the odd avian. The result is a design that is reduced to its essentials combined with high quality mechanics. For us it is important to preserve as much as possible of the existing substance. Movement, dial and hands as well as the aluminum and glass remain original. The control electronics and the dial lighting are modernized. 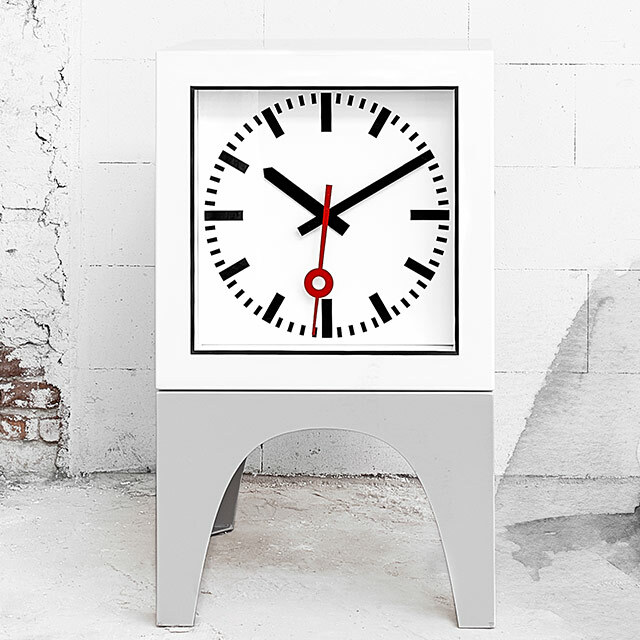 A handwelded steel base makes the Blockuhr a unique clock at the height of a bar table. In the manufacturing process the train station clock and the steel base are sand blasted and provided with a pure white respectively lightgray coating. The color of the housing and base can also be selected individually by the customer.